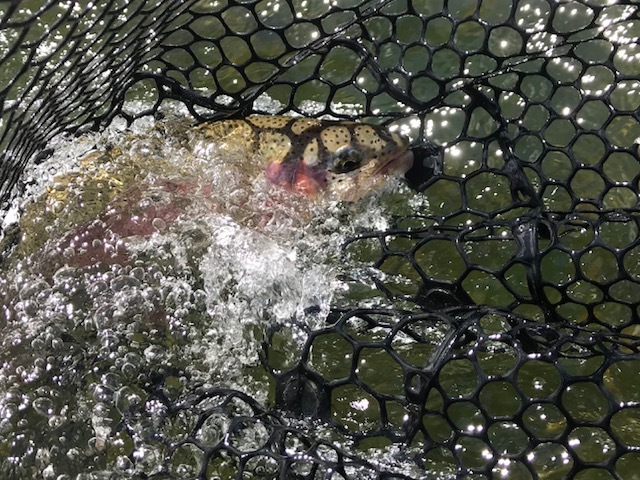 We are in the dog days here on the Yakima and the fishing has remained strong, although we are seeing some warmer water temperatures even in the upper reaches of the river. If at all possible, fish early and get off the water early. Fish are looking up for stonefly adults during the early mornings, and the first few hours of daylight have seen some great dry-fly fishing with Chubbies, Gypsy Kings, Glomers, and PMX in #8-12. This time of year it is a good idea to fight your fish fast (a great way to do this is to bump up your tippet a size or two, allowing you to put extra pressure on the fish during the fight without breaking off flies), as well as keeping the fish in the water once landed, and minimizing the amount of time fish are handled once in the net. One great way to keep the fish healthy while still being able to experience the take and hook-up is to bend your hooks out. You'll still feel the fish, but most will come unpinned after a few seconds. Being that we are in a rodeo town, adhering to "rodeo rules" is a good rule of thumb...8 seconds and then they're off! Remember that although we are practicing catch and release, fish can still be killed or seriously injured if not played and landed properly. Take extra care to help out our fishy friends during these dog days of summer so that they can survive and thrive in our rivers year-round.